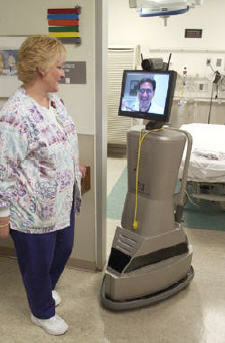 InTouch Health is now leasing a remote-controlled medical telepresence robot called The Companion to hospitals and nursing homes nationwide. The 200 pound robots stand about five feet tall and have computer screens for "heads"; they are controlled remotely by physicians with a wireless broadband Internet connection, the right software and a joystick control. The purpose of the "rounding robots" is to allow physicians who admit patients to widely separated medical centers to be able to round (that is, visit or provide a consultation to) their patients without having to waste hours of travel time in their cars. Patients can see their own doctor and speak with him or her in real time; the physicians can also see and hear their patients. The robot can travel about 2 miles per hour; a safety mechanism uses infrared warning sensors to keep the robot from bumping into people and objects. InTouch leases them for about $3,000 per month, which includes hardware, software and support. See the medical mantis from Peter Watts Starfish for a taste of how a medical telefactoring experience might work. See also the story Patients happy with robo-doc which details a Johns Hopkins study on the use of this technology; 57% of patients thought they felt comfortable with "telerounding" and 50% preferred a telerounding visit from their own physician to a visit from a real doctor they didn't know. Read more about medical telepresence techologies at The Medical Telepresence Tour.